References m_iBorderStyleConnect, m_iBorderThicknessConnect, m_iLineBotConnect, m_iLineLeftConnect, m_iLineRightConnect, m_iLineTopConnect, m_iShadingEnableConnect, m_iShadingOffsetConnect, m_pPreviewWidget, m_wApplyButton, m_wBorderColorButton, m_wBorderStyle, m_wBorderThickness, m_windowMain, m_wLineBottom, m_wLineLeft, m_wLineRight, m_wLineTop, m_wPreviewArea, m_wShadingEnable, and m_wShadingOffset. References m_iBorderStyleConnect, m_iBorderThicknessConnect, m_iLineBotConnect, m_iLineLeftConnect, m_iLineRightConnect, m_iLineTopConnect, m_iShadingEnableConnect, m_iShadingOffsetConnect, m_wApplyButton, m_wBorderColorButton, m_wBorderStyle, m_wBorderThickness, m_wCloseButton, m_windowMain, m_wLineBottom, m_wLineLeft, m_wLineRight, m_wLineTop, m_wPreviewArea, m_wShadingColorButton, m_wShadingEnable, m_wShadingOffset, s_apply_changes(), s_close_window(), s_delete_clicked(), s_destroy_clicked(), s_line_bottom(), s_line_left(), s_line_right(), s_line_top(), s_on_border_color_clicked(), s_on_border_style_clicked(), s_on_border_thickness_clicked(), s_on_shading_color_clicked(), s_on_shading_enable_clicked(), s_on_shading_offset_clicked(), and s_preview_draw(). 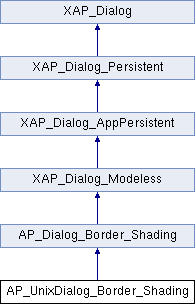 References abiDialogSetTitle(), AP_Dialog_Border_Shading::ConstructWindowName(), AP_Dialog_Border_Shading::getBottomToggled(), AP_Dialog_Border_Shading::getLeftToggled(), AP_Dialog_Border_Shading::getRightToggled(), XAP_App::getStringSet(), AP_Dialog_Border_Shading::getTopToggled(), XAP_StringSet::getValueUTF8(), label_button_with_abi_pixmap(), localizeButton(), localizeLabel(), localizeLabelMarkup(), XAP_Dialog::m_pApp, m_wApplyButton, m_wBorderColorButton, m_wBorderStyle, m_wBorderThickness, m_wCloseButton, AP_Dialog_Border_Shading::m_WindowName, m_wLineBottom, m_wLineLeft, m_wLineRight, m_wLineTop, m_wPreviewArea, m_wShadingColorButton, m_wShadingColorLabel, m_wShadingEnable, m_wShadingOffset, m_wShadingOffsetLabel, newDialogBuilder(), s, UT_DEBUGMSG, XAP_appendComboBoxText(), XAP_makeGtkComboBoxText(), and xxx_UT_DEBUGMSG. References m_iShadingEnableConnect, m_wShadingColorButton, m_wShadingColorLabel, m_wShadingEnable, m_wShadingOffset, m_wShadingOffsetLabel, and xxx_UT_DEBUGMSG. Referenced by event_shadingPatternChange(), and setShadingPatternInGUI(). References AP_Dialog_Border_Shading::ConstructWindowName(), m_windowMain, AP_Dialog_Border_Shading::m_WindowName, AP_Dialog_Border_Shading::setAllSensitivities(), and UT_ASSERT. References BORDER_SHADING_NUMOFSTYLES, event_previewExposed(), m_wBorderStyle, sBorderStyle, and AP_Dialog_Border_Shading::setBorderStyle(). References event_previewExposed(), AP_Dialog_Border_Shading::m_dThickness, m_wBorderThickness, AP_Dialog_Border_Shading::setBorderThickness(), sThickness, and UT_std_string_sprintf(). Referenced by event_BorderStyleChanged(), event_BorderThicknessChanged(), event_ShadingOffsetChanged(), s_line_bottom(), s_line_left(), s_line_right(), s_line_top(), s_on_border_color_clicked(), s_on_shading_color_clicked(), and s_preview_draw(). References event_previewExposed(), AP_Dialog_Border_Shading::m_dShadingOffset, m_wShadingOffset, AP_Dialog_Border_Shading::setShadingOffset(), and UT_std_string_sprintf(). References _setShadingEnable(), BORDER_SHADING_SHADING_DISABLE, BORDER_SHADING_SHADING_ENABLE, m_wShadingEnable, AP_Dialog_Border_Shading::setShadingPattern(), and xxx_UT_DEBUGMSG. Referenced by s_on_border_color_clicked(), and s_on_shading_color_clicked(). References _connectSignals(), _constructWindow(), AP_Dialog_Border_Shading::_createPreviewFromGC(), _populateWindowData(), abiSetupModelessDialog(), BUTTON_CLOSE, DELETEP, AP_Border_Shading_preview::draw(), XAP_App::getApp(), GR_UnixCairoGraphics::init3dColors(), AP_Dialog_Border_Shading::m_pBorderShadingPreview, m_pPreviewWidget, m_windowMain, m_wPreviewArea, XAP_App::newGraphics(), AP_Dialog_Border_Shading::startUpdater(), UT_DEBUGMSG, and UT_return_if_fail. References UT_RGBColor::m_blu, UT_RGBColor::m_grn, UT_RGBColor::m_red, m_wBorderColorButton, and xxx_UT_DEBUGMSG. References PP_PropertyMap::linestyle_type(), m_iBorderStyleConnect, m_wBorderStyle, style, and xxx_UT_DEBUGMSG. References AP_Dialog_Border_Shading::_findClosestThickness(), m_iBorderThicknessConnect, m_wBorderThickness, and xxx_UT_DEBUGMSG. References AP_Dialog_Border_Shading::getBottomToggled(), AP_Dialog_Border_Shading::getLeftToggled(), AP_Dialog_Border_Shading::getRightToggled(), AP_Dialog_Border_Shading::getTopToggled(), m_wLineBottom, m_wLineLeft, m_wLineRight, m_wLineTop, m_wShadingColorButton, m_wShadingEnable, and m_wShadingOffset. References UT_RGBColor::m_blu, UT_RGBColor::m_grn, UT_RGBColor::m_red, m_wShadingColorButton, and xxx_UT_DEBUGMSG. References AP_Dialog_Border_Shading::_findClosestOffset(), m_iShadingOffsetConnect, m_wShadingOffset, and xxx_UT_DEBUGMSG. Referenced by _connectSignals(), AP_UnixDialog_Border_Shading(), and setBorderStyleInGUI(). Referenced by _connectSignals(), AP_UnixDialog_Border_Shading(), and setBorderThicknessInGUI(). Referenced by _connectSignals(), and AP_UnixDialog_Border_Shading(). Referenced by _connectSignals(), _setShadingEnable(), and AP_UnixDialog_Border_Shading(). Referenced by _connectSignals(), AP_UnixDialog_Border_Shading(), and setShadingOffsetInGUI(). Referenced by AP_UnixDialog_Border_Shading(), runModeless(), and ~AP_UnixDialog_Border_Shading(). Referenced by _connectSignals(), _constructWindow(), and AP_UnixDialog_Border_Shading(). Referenced by _connectSignals(), _constructWindow(), AP_UnixDialog_Border_Shading(), and setBorderColorInGUI(). Referenced by _connectSignals(), _constructWindow(), AP_UnixDialog_Border_Shading(), event_BorderStyleChanged(), and setBorderStyleInGUI(). Referenced by _connectSignals(), _constructWindow(), AP_UnixDialog_Border_Shading(), event_BorderThicknessChanged(), and setBorderThicknessInGUI(). Referenced by _connectSignals(), activate(), AP_UnixDialog_Border_Shading(), destroy(), getWindow(), notifyActiveFrame(), and runModeless(). Referenced by _connectSignals(), _constructWindow(), AP_UnixDialog_Border_Shading(), and setSensitivity(). Referenced by _connectSignals(), _constructWindow(), AP_UnixDialog_Border_Shading(), and runModeless(). Referenced by _connectSignals(), _constructWindow(), _setShadingEnable(), setSensitivity(), and setShadingColorInGUI(). Referenced by _constructWindow(), and _setShadingEnable(). Referenced by _connectSignals(), _constructWindow(), _setShadingEnable(), AP_UnixDialog_Border_Shading(), event_shadingPatternChange(), and setSensitivity(). Referenced by _connectSignals(), _constructWindow(), _setShadingEnable(), AP_UnixDialog_Border_Shading(), event_ShadingOffsetChanged(), setSensitivity(), and setShadingOffsetInGUI().